Some transfer gossip refuses to go away; often this gives credence to its likelihood, but not always. 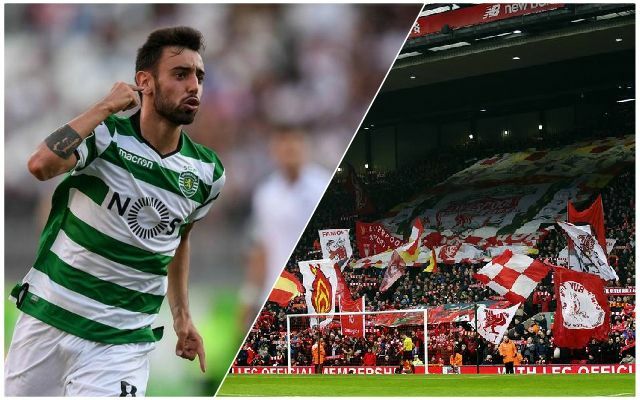 Today, reports coming out of Portugal from the newspaper, Record, are once again linking us with Sporting Lisbon star Bruno Fernandes. The Portugese outlet is running a story on the attacking midfielder’s importance to a Sporting team decimated by the controversial player walk-out. When fans attacked a training session, Rui Patricio, William Carvalho and Gelson Martins all terminated their contracts. Fernandes did too, in fact, but was convinced to return to Sporting. Since then, the Portuguese maestro has registered an impressive 23 goals and 13 assists in all competitions. Last summer, we went for Nabil Fekir, but changed our mind at the last minute after the results of the Frenchman’s medical. Fernandes is of similar age, has equally quick feet, plays in the same positions and scores bucket-loads of goals – but is stronger with his right – not his left. Bruno Fernandes with a goal & two assists today! Record are claiming that Sporting Lisbon are trying to build the team’s future around Fernandes, but the newspaper also suggests that, despite trying to protect their asset with a massive €100m release clause, it might be in vain. Once the summer rolls in, Record have reported the Portuguese giants will struggle to fend off big money offers from Liverpool, and other potential suitors (namely, Manchester United, Milan, and Atlético Madrid). The newspaper also claims that Fernandes’ release clause could be bypassed by an attractive offer: even if it fails to meet the 24-year-old’s €100m clause. Sporting’s desperate financial situation might force them into a sale, but it will surely lower his price tag. If Michael Edwards & Co. are as quick and alert this summer as they were last year, then we could snap up Fernandes for a reasonable fee. He’d definitely do a job for us and we’re lacking goals from midfield at the moment. Plus, there would be the added bonus of depriving others of a sought-after player (which we’ve been on the receiving end far too often in the past).